After hearing such rave reviews of young restaurant Pondicheri here in Houston, I decided to check it out with a friend. Set in a posh up and coming neighborhood in the Upper Kirby district (the only parking were this well manicured metered spots - rather unusual in parking abundant Houston), the theme is Indian food. Well, Indian reinterpreted to Houston mores. We dropped in for lunch, and most of the dishes pretty much focused on sandwiches, salads and and wraps, with some inventive bakery items. While what we had was by no means bad, I'll have to admit that the flavors lacked the verve and pop I've come to expect from Indian cooking. Wraps were a bit on the greasy side, like mutant burritos. In most cases, we spent most of the meal discussing what little tweak we would like to do to the dishes to bring it to top form. Chicken tikka masala wrap was spare, and rather uninspired. At least they didn't use white breast meat, and thus it stayed moist. But could have used chutney or a pickle to bring it up a notch. Fish masala burger was fine, albeit unwieldy. But the fries were a disappointment. 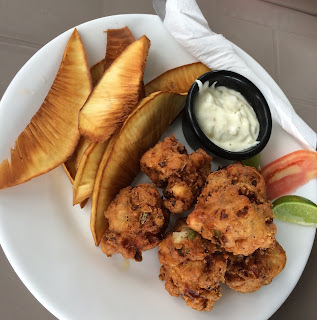 The spicy coating was inventive, but the potato itself was mealy and chalky, as if the wrong kind of potatoes were used. The famed kachumber salad, a mix of cucumber, peanuts and mangos, was again, just short of greatness. Seasoning was bland (I kept wishing for a dash of toasted cumin). Cucumber dominated the flavor profile, the mangos tasted like an afterthought, and the peanuts appear to have been soaking the salad juices and came across as mushy. This need not be the case. 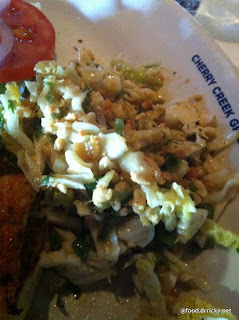 Peanut coleslaw from Cherry Creek Grill, in Denver, uses freshly toasted peanuts in their salad, which conveyed a very pleasant crunch while highlighting the dish. I did enjoy the inventive Coconut Chocolate Almond Basic cookies, which boasted plenty of basil flavor. Other spiced cookies were available. After speaking with others, I got the impression that breakfast is where Pondicheri serves up its strongest hand. Maybe someday, I'll get to check it out then (not that awesome breakfast options are particularly abundant in Houston save for breakfast tacos). In the meantime, I'll have to rate it a so-so experience.